Racing is about fun, family, fortune, fortitude and competition. Last weekend, for me, was an example of all of racings virtues. From the camaraderie of fellow racers, to the weather, one could not ask for a better experience. It also validated that my efforts to become a better, smoother, faster, more aware racer are working. This was also the first time I focused on Visualization – seeing my turn-in and track-out points, my shift points, my possible lines, and Micro Goals. I want to race as long as I am capable because it makes me want to grow. The 6 reasons why this was my most amazing racing experience, so far! 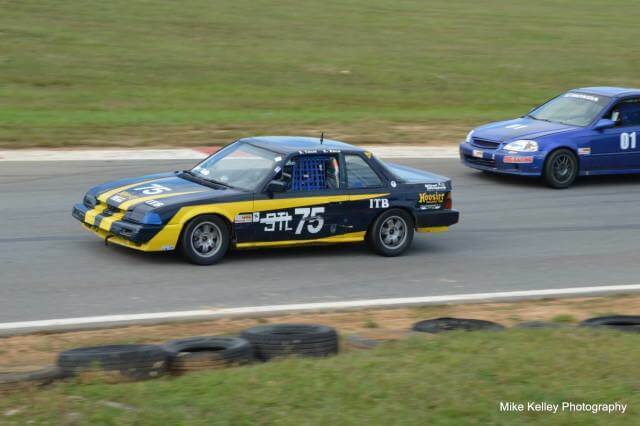 It was the first time I qualified 1st in SCCA ITB. Drove side-by-side with 1st place driver over the Finish Line! The furthest I’ve pushed myself outside my comfort zone! My first “almost win!” I earned a 2nd place finish in ITB; however, the event itself, was a tremendous growing opportunity. The races took place at Summit Point main hosted by the WDC Region SCCA in “Le Gran,” my team’s 1987 Honda Prelude Si ITB class built by Matt Kessler. She was formerly owned by Dave Gran of Go Ahead, Take the Wheel notoriety, and further tweaked by Chris Rallo, my teammate, who won an ITB race last Labor Day Weekend at Summit Point. Preparation is a key to victory, which is why I believe in “tracking” a race car, and taking advantage of test days, so you can get fully dialed in. Driving a slow car fast, like an ITB class car, is an interesting challenge, one I believe will make me a better racer long-term. In the Qualifying Race on Saturday, I had the fastest lap time of the class by over a second, and ended up in 1st place for the grid on Sunday! I ran an almost 1:31 flat. Sunday’s race began with a challenging start. The currently 2nd place driver executed an excellent pass by me in the turn 1 brake zone. Then the 3rd place finisher managed to get around me for part of a lap. It was time to focus and bring the cowbell! The winner and I were running head to tail for the rest of the race, crossing the Finish Line within a 10th of a second!